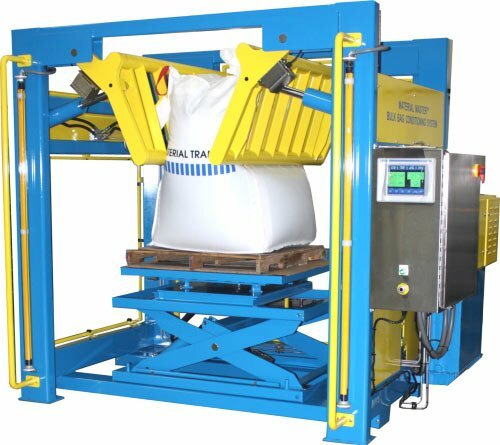 Powered rotary-lift table with 36” of travel and 4000# capacity allows complete conditioning of a wide range of bag sizes. Hydraulic system is a Parker 1500 psi unit, with dual 5 GPM pumps and 10 HP motor. Custom dust-tight carbon steel hydraulic enclosure for the above unit. Machine features clear acrylic guards on three (3) sides of the unit with a Banner light curtain on the load side for operator safety. NEMA 4X electrical enclosure with PLC auto mode and Panel View Plus 600 touch screen control . Electrical system upgraded for Class II, Division II, Group G location service.